What Can I Do To Keep My Kids Safe? Stockpiling at the Dollar Store? 2 Minute Warning…. Can I Save My Family From Disaster? I spent some time hiking this weekend. In my pack was an apple, some cheese, water, and this book…. In history class at school the Revolutionary war was Paul Revere riding, and George Washington crossing the Delaware. The British are abstract characters wearing Red Jackets, and the Colonists are a bunch of guys who throw tea in the Boston Harbor. No wonder kids don’t like history it’s too vague and distant. The novel “King’s Mountain” brings the people of America to life. 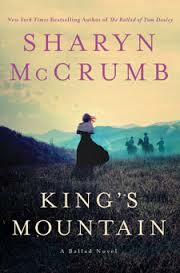 Sharyn McCrumb’s latest novel, “King’s Mountain”, tells the story of how the Overmountain Men defeated the British Army at the Battle of King’s Mountain, turning the tide on the Revolutionary war. It’s more than just a story of a battle. This is the story of John Sevier, an ancestor of Sharyn McCrumb, who lived on the frontier of the colonies. A homesteader in the Carolina mountains, he spends his time worried about Indian attack, not the Revolutionary War. McCrumb takes us deep into the life of people living in the mountains, and the dangers they face every day. It’s clear she understands the strong independent spirit that runs through these people. She knows them. In the mountains, the distant Revolutionary war is abstract, and has nothing to do with them. However, when a British Major Patrick Ferguson begins to make threats against these homesteaders, they decide it’s time to get in the fight. What does it take to assemble a militia, to outfit them with food and supplies? This is a group of men, not an organized army. They are farmers and hunters; homesteaders not trained military. The leaders of the Overmountain Men are able to bring them together. Imagine what it takes to convince a man to march hundreds of miles in heat and cold. He’s not getting paid, the food is what he can carry or forage, and the risk of death is high. How bad do you want your land? How important is your independence. The other side of the story is also presented. Sharyn McCrumb uses the voice of Virginia Sal, a washerwoman, to describe life in the British Camp. As a camp follower, she’s privy to conversations and events that make the Tories more than paper cut outs of Red Coats. The battle itself is the smallest part of the novel. “King’s Mountain” is not the story the fight; it’s the story of the struggles to forge independence. This is about standing up against a distant government that has no connection with the people it oversees. “King’s Mountain” is the tenth book of Sharyn McCrumb’s Ballad series, and with each book she writes, her writing gets deeper and richer. Reading McCrumb’s stories is the closest you will ever come to being there. This entry was posted in book review and tagged Kings mountain, militia, overmountain men, revolutionary war, sharyn Mccrumb. Bookmark the permalink.